According to Gartner, organizations will spend approximately $92 billion in IT Security in 2016. Despite these investments, we hear about new data breaches almost on a daily basis which makes securing the growing attack surface more important than ever. Thus, staying abreast of the latest emerging trends in cyber security is essential when aligning your information security plans. In this session, renowned cyber security expert Dr. Srinivas Mukkamala will explore emerging trends in network security, covering topics such as big data in security, threat and business intelligence as factors to determine cyber risk exposure, and the role of human-guided machine learning in orchestrating remediation actions. 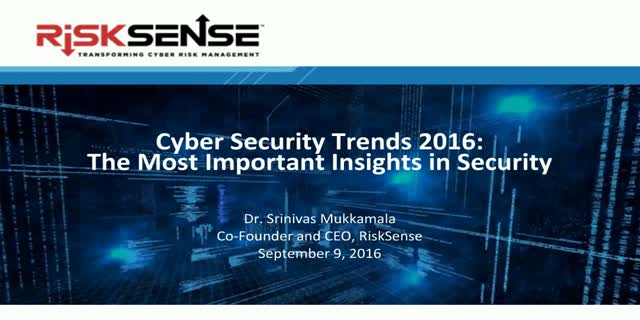 Presented by: Dr. Srinivas Mukkamala, Co-founder and CEO, RiskSense Inc.